Last week, buy my dad and I planned out dinner for some guests. We wanted something nice, but not too complicated – tt was a weeknight, after all. In the end we settled on grilled salmon because it’s kind of fancy, healthy and easy to make. My favorite salmon marinade is really simple – 2 parts olive oil, 1 part soy sauce and 1 part Dijon mustard. Just mix it up, pour it over your salmon and let it sit for as long as you’d like. Toss everything onto the grill (on some foil) or under the broiler for 15 minutes. It’s always delicious. 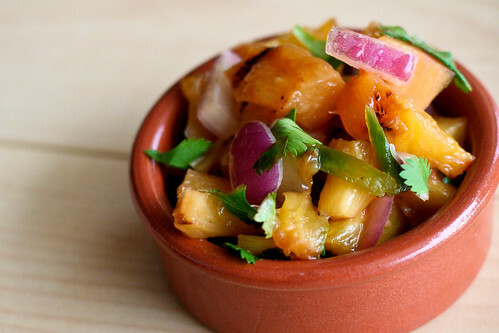 This time, we wanted to top it off with something a little more festive and I decided on grilled pineapple salsa. I charred some pineapple pieces on the grill, then tossed them with red onion, jalapeno peppers, cilantro and lime juice. The grilled pineapple was caramelized and sweet with a little of that BBQ char flavor, the onions and lime juice countered the sugar with some bite and the jalapenos added just the right amount of heat. Store the salsa in the fridge for up to 5 days. If you don’t plan on eating it immediately, I would leave the cilantro out and just stir it in right before you’re ready to serve. Otherwise, it will wilt in the fridge. This looks great! You say it’s good with chips too? Not too chunky? I want to make it to bring to a bbq and serve with chips since I’m not in charge of the main dish. Thanks for the recipe! amanda – Thanks! The salsa was a little chunky for chips, but it’s because I diced the pieces too big. If you dice them a into smaller pieces, it will work great. Also – that “bowl” is TINY. I usually use it for olive pits. This looks good, and perfect for topping on meats, such as fish! I would love to serve this alongside some coconut rice and a piece of seared ahi tuna! This sounds fantastic. Off to buy pineapple. . .
Nope, I don’t have any problems with another salsa recipe. Particularly one that sounds so tasty. Though I didn’t try the salsa recipe, I followed your tips for marinating and preparing salmon. I made it for my boyfriend last night, and he LOVED it! He tends to like food that’s not fussy, with few ingredients, so the main ingredient is the star of the show. I added a little freshly ground black pepper over the salmon before broiling, and he couldn’t stop raving about it! Thanks! Its delicious to roast the red pepper just like you did with the pineapple. Pingback: Everyday Southwest » It’s Spring! Time for Pineapple Salsa!